｢불설문수사리일백팔명범찬｣은 宋朝의 法天(?～1001)이 990년 무렵에 한역한 것으로 108가지의 이름으로 문수사리를 찬양한 전체 19편의 약 900자에 불과한 경전이며, 개개의 범찬(梵讚)은 4句로 구성되어 있고 모두 범어(梵語)를 음역하였다. 조사본 ｢불설문수사리일백팔명범찬｣은 宋朝의 개보판대장경(開寶板大藏經)을 저본으로 하여 12세기 무렵에 간행된 초조대장경본으로 추정되며, 함차(函次)는 ‘봉(封)’이고 판수(板數)는 도합 6판이다. 저지(楮紙)의 표지에 ‘문수일백팔명범찬(文殊一百八名梵讚)’과 함차 ‘봉(封)’이 묵서되어 있고 권두(卷頭)에는 ‘불설문수사리일백팔명범찬’의 경명(經名)과 ‘서천역경삼장조산대부시홍려경전교대사신법천봉조역(西天譯經三藏朝散大夫試鴻臚卿傳教大師臣法天奉詔譯)’의 역자사항(譯者事項)이 나타나고 있다. 권말단(卷末端)에는 면지(面紙)를 연미(燕尾)모양으로 절단하고 양단(兩端)에 주칠(朱漆)의 죽축(竹軸)을 붙였다. 본서는 초조대장경(初雕大藏經)으로 현재 전하는 것이 없는 유일본이다. 또한 권말(卷末)에 기록된 증의(證義), 필수(筆授), 철문(綴文), 증범문(證梵文), 증범의(證梵義), 윤문(潤文) 등 역경과 관련된 참여자 명단 등 초조대장경(初雕大藏經)의 간행과 관련된 여러 사실을 확인할 수 있는 귀중한 자료이다.. This Buddhist scripture (Sanskrit Eulogy to the One Hundred and Eight Names of Manjusri) is a short text composed of 900 Chinese characters arranged in 19 chapters that praises the bodhisattva Manjusri and his one hundred and eight names. This Chinese version, a transliteration of the original Sanskrit text, of the scripture was completed around 990 by a Song monk named Fatian (?-1001). 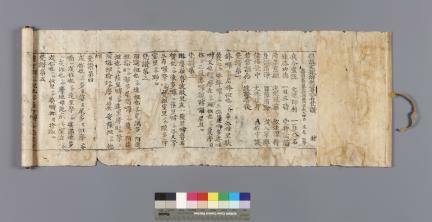 This edition of the eulogy is conjectured to belong to the first edition of the Tripitaka Koreana published in the twelfth century on the basis of the Kaibao Tripitaka of the Song Dynasty, and is the only known example printed from the first Tripitaka Koreana woodblocks.